The phrase comes from the real estate world but it’s actually a term with meaning that crosses into many areas of our everyday lives. We now live in a world where we are inclined to make faster and faster decisions. Yes, I’m interested – no, I’m not interested. And then we proceed, based on what is often a gut response. In the real estate market, an unappealing photo in an ad might mean no one even bothers to view the property. Studies show that a lack of “curb appeal” as you drive by a property often results in nothing beyond a drive-by. It simply won’t matter how wonderful the “inside” is because the viewer never took the time to look. What about your website? Are people simply “driving-by?” You can follow analytics and get some sense of this. Analytics can be a wonderful tool for examining the traffic on your site and continuing to fine tune, but they are not the only tool to judge your website. By the time you have a website and are following the analytics you don’t want to learn that a high percentage of visitors never move past your home page and may even leave very quickly. Once they’ve “cruised by”, they very likely won’t return. So, what can you do? Make sure your website HOME page is visually appealing AND designed to do its job before you go-live. 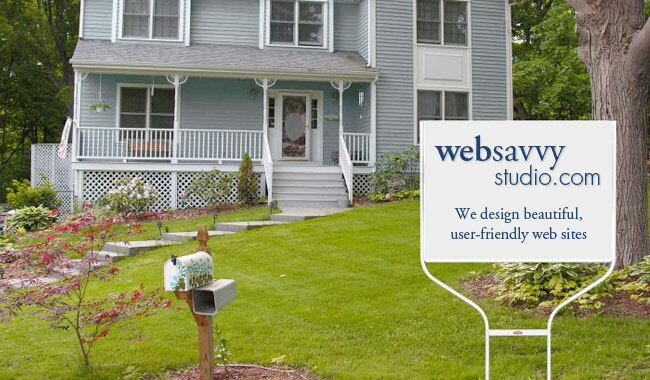 Here at WebSavvy Studio we like to keep the overall look simple. A clean design is easy on the eye and much friendlier for browsing. Overwhelming a visitor with too much at once is a good way to lose him. A simple flow of information that one can navigate through without a lot of clicking and searching will serve you well. An open airy design will help draw attention to the areas you want your visitor to focus on. Even though a visitor to your home page may not be able to read everything on the page in a nano second, you don’t want them to feel overwhelmed, but to feel like there is an orderly flow set up so they can peruse your site comfortably. And remember, you have only a second to have this impression register with your site visitor. Here’s a good rule of thumb that I use when I view website home pages that might help you as you consider what “works” for you. I keep a list of words by my computer and when I open a new website, I make a split second decision as to which word best describes my initial impression. You can make your own list but here is mine. The list grows and changes from time to time but I find that most sites for me fit one of these descriptions. If your first impression is in the positive list you’ll likely dig deeper into the site. If not, you’re unlikely to stay on the site. Just like the “curb appeal” in the real estate market. Go ahead and give this a try. Check out some sites of competitors or simply businesses that might interest you. It’s actually kind of fun. And don’t be shy about asking others to use this simple criteria to critique your home page. After all, you’re putting your website out there for the world to see and wouldn’t you much rather know if it has that winning curb appeal BEFORE there are too many drive-bys? Let us know what you discover. Be sure to share in your response any new descriptive words that come to mind for you in your travels through the web. We are excited to hear what you think. Engaging. Cool. LOL funny. Clean. Simple. Boomer-friendly. Thanks for this great post!